If your team is like most ecommerce organizations these days, you have already made some progress in your personalization journey by serving relevant content to your ideal customer groups and optimizing experiences that you serve. The ability to deliver true 1-to-1 personalized experiences across all channels has been the dream of every marketer — personalization increases loyalty, drives higher conversions and grows revenue. Unfortunately, it has been incredibly difficult to deliver on individualized experiences at scale and various attempts at personalization over the past four decades have failed, resulting in greater unpredictability in revenue. With recent advances in artificial intelligence (AI), this changes. It’s finally possible for brands and retailers to deliver on the promises of 1-to-1 personalization and serve the ideal experience to their each of their customers across all touchpoints, thus recognizing them as unique individuals. Just because you can, does not always mean you should, so here are the 3 most important reasons why you should pay attention to your ecommerce personalization strategy today more than ever before. Marketers have long struggled against the inevitable diversity of their audiences and the impossible task of designing creative for each individual. To substitute, we’ve adapted a practice of maximizing sales by creating experiences for an imagined average consumer in hopes that this one-size-fits-most model would resonate with as many people as possible. 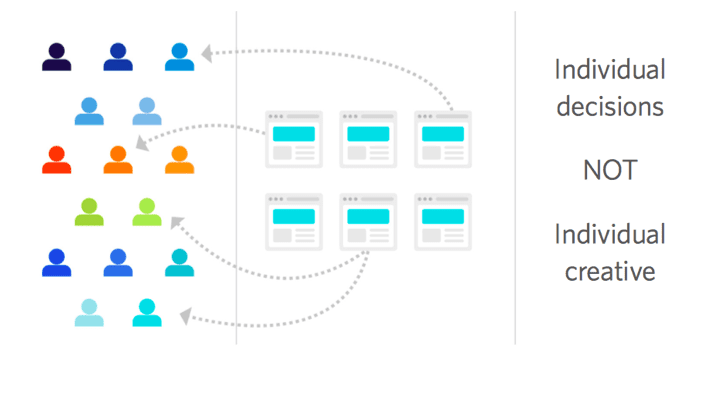 The method known as “segmentation” allows us to define distinct groups based on insights about the audience, so that we can target each group with creative tailored specifically for the segment. The problem with this approach is that those segments are defined by only a few data points and applying it at scale can be challenging. Customers who fall into a Women’s Urban Hipster segment may prefer different colors, styles, purchasing frequencies, price brackets and categories. This may all change based on their geography and time of browsing. Treating this group as a homogenous entity is a challenge as only some of them would be likely to respond favorably to an experience. We need a much more nuanced view of our customer population, one that may consist of hundreds of data points, not only a select few. So, while segmentation may help improve results for some, it does eventually reach a ceiling of effectiveness. Marketers and consumers are better off when we think about optimization as improving communication to individuals, not sales averages. This change of reference is a subtle difference, but an important one. When marketers more effectively communicate, people will take actions they wouldn't have taken otherwise not because they were offered a steep discount, but because they’ve been shown the value that’s unique to them. 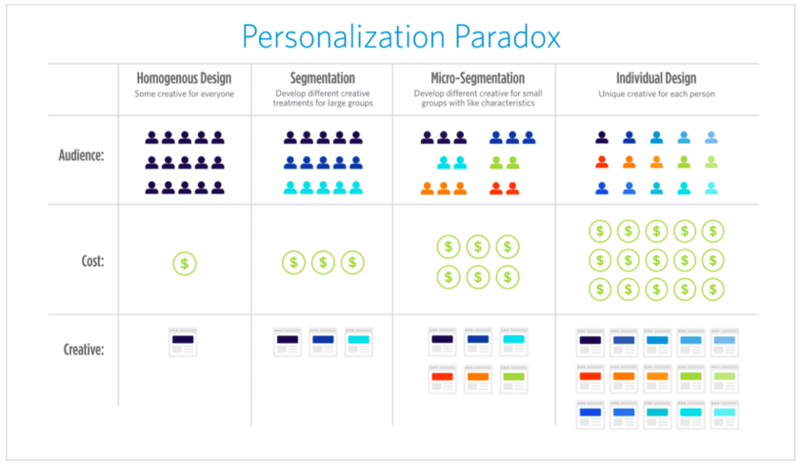 A segmentation-based approach means iteratively identifying and targeting the largest opportunity. We identify a segment or a subset of people identified by a set of parameters within a channel and introduce that segment to an experience tailored to what we think they’re likely to respond to. And, in the example of the Women’s Urban Hipster segment above, we can improve on the experiences of a segment by getting more granular and creating micro-segments. When we’re talking about single-channel, single-session segmentation, this is a relatively simple task. But as we iterate and make more micro-segments, the opportunities get smaller and yield diminishing returns. We eventually hit a plateau, where marketing spend to manage the segments and all the creative for them is greater than the return. But, the reality is that 1-to-1 personalization doesn’t require unique content for every individual. You can get a long way in individualizing experiences using a handful of creative elements that reflect the varied interests of your customers. What makes for a good 1-to-1 experience isn’t just the brand imagery, message, product recommendation, or promotions, but the combination of those elements, across a particular touchpoint (i.e. email vs. SMS vs. social messaging), at the right time for that individual. To do this, it’s absolutely imperative we break the old thinking if we want to deliver personalization at scale. Strong alignment with customer needs is directly correlated to financial success regardless of industry. For example, in Forrester’s August 2015, “The Revenue Impact of Customer Experience,” a mere one-point gain in the Customer Experience Index was found to be worth $175 million in additional revenue to a wireless provider, $118 million to a luxury automaker and $65 million to an upscale hotel chain. Caring about customer needs can be a crucial part of your performance strategy. If you shift thinking from “How much can I sell?” to “How much can I help?” the money will follow. The tried and true methods of A|B testing, optimization, segmentation and targeting will continue to be essential tools in the marketer’s toolbox. But, with the desire to improve customer experience and increase conversions, AI-driven personalization offers a tremendous benefit. And the best part? As machines are constantly learning and improving, the experiences get even more relevant. So, why wait any longer — embrace the AI-driven personalization today. Thanks to Yulia Novozhilova for sharing her advice and opinions in this post. Yulia runs demand gen programs at Monetate and has a passion for startup environments, emerging technologies and innovation. You can follow her on Twitter or connect on LinkedIn.